This gray bus box will provide quality service under normal use and wear. Great for soaking flatware and collecting dishes, this tub features a pebbled exterior finish and sturdy reinforced handles. Its polypropylene material delivers quality durability, while its classic design is stackable and great for storage. We used to go thru a lot of bus tubs as they would crack from either washing or carrying heavy dishes in them. This particular brand is great, we have had no issues and they have lasted a long time. These are so good for storing small items. I'd say they are about 5 gallon in size. I've use them from anything to storing shoes to keeping inventory for my small business. These grey plastic bus bins are made of a very strong plastic and can hold just about anything. We use ours to store clean kitchen bins and lids for organizing. These gray bus tubs are great for food service. They are extremely sturdy and durable, easy to clean and they stack very neatly for convenient storage. The variety of colors allow for differential between raw, cooked and disposable items. Would definitely purchase these again. Very sturdy bus tubs that work great for storing dry goods or cans on shelves and for holding dirty dishes. Easy to clean. We love these tubs. We use them to store raw product. They come with a sort of funky smell but it washes out. We will be buying again. These Gray Polypropylene Bus Tubs works great for our outdoor kitchen. We use them to bring dishes back and forth so we don't have to make so many trips. Great Value! This bus tub is as durable as any of the brand name options available, extremely sturdy and useful. We use these tubs to transport dishes before and after a catered event. I ordered the gray ones to use exclusively for pork and these things a quality pieces of equipment. I've never had a complaint about them and they are very tough. These bus bins are very inexpensive and get the job done. Good quality, hold a lot, and can be used more then for just bus bins. These tubs are great for all you need during a busy rush. and they work great just for holing your smalls while they soak in the sink. Use this for anything. We store proteins and organize our walk in with these. They last forever and are almost near indestructible. Can only use more! This price can not be beat,and I shopped the heck out it.I only bought a few to test out(I figured they would be weak)but to my surprise they are good quality with out the high price tag. We use this at home clean up after for parties and outdoor dining. It is very well made and sturdy. Doesn't feel flimsy when filled with dishes. We use this bus tub in our cleaning business for holding soiled cloths, towels, mop heads, etc for laundering. We like this very much and it's durable and inexepensive. A great price point for a highly versatile and essential everyday use item. We put several of these through their paces everyday during service and they seem to last and adequate amount of time. Great bus tub at an affordable price. Through daily use it has held up well. You wont go wrong with this one. If you have multiples of these- they stack great. Make sure to dry thoroughly between washes- before stacking. I bought this bus tub specifically for portable bar use to keep mixers cold. The tub worked as planed My partner who heads up bar service at a private event we recently worked was pleased with the deep tub. We use these bus tubs for all sorts of things. They last forever too, which is great. We use these mainly for large bulk prep. Random uses of these tubs for personal use: transport food, transport tea, store frozen items in freezer. These tubs are extremely versatile for all types of projects. Such great, high quality tubs at an extraordinary price! I can't recommend these tubs enough! We use them for a variety of uses, but mainly to bread fish. Great value. Fit well with the bus tub lid. Not so strong. I would say I could hold 40 LB but if you put more than that it might break. Overall Good. We bought these tubs for our office to use to put dirty utensils in after lunch. They work great for this purpose and are sturdy. This bin is going to be strictly for cleaning supplies. I'm gladiator got these to help with organizing all these great cleaning products. Because we all know that is a grey area! We purchased these bus tubs for use at both our weekly pot luck clean up, and for storage for our annual Greek Fest. For clean up, they are the perfect size to fit on the counter to wash, rinse, and sanitize dishes. For Greek Fest, they, with their corresponding lids are perfect and cheap for storage of various items. These bus tubs are a great price. Durable but strong for the price and have sturdy handles. They come in many colors. They also stack neatly when not in use. We actually ise these to store items. They are bery durable and strong. They can hold a lot and it we need to we can stack them. We use these tubs for storing food prep materials for the kitchen. While they are a decent size, the drawback is that the plastic is quite brittle. Out of the batch of 6 that I bought some months ago, all are cracked in some place or another. I would recommend using it if you need a storage vessel that doesn't need to take a beating, but for a hustle-bustle kitchen, they are not very good. These tubs are the most useful items I have purchased lately!! We use them for everything imaginable. Great for meat grinding and vegetable prepping before canning. I ordered more of these because of the price and quality of these tubs. Exactly what you think it would be. Durable, good size. Handy to have around and the plastic is not too heavy. I would like a lid for this, as well. 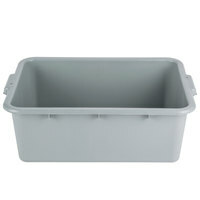 This 20" x 15" x 7" Gray Polypropylene Bus Tub is very durable. It makes fast work of clearing tables, or work spaces. In multiples, these tubs are stackable which saves space, and they can also be used as a soaking tub for flatware or dishes. It holds a lot of items, but is easy to transport with it's sturdy side handles. A must have item for any restaurant. Although we do not bus tables at church, this tub is great to fill with all of the dirty dishes to keep the sink organized. Amazing quality for the price. Don't skimp on cheap bus bins - these poly bins are extra sturdy for heavy glassware and dishes. They actually clean up really easily as well so you can look professional. These bins are a Great Product. They works perfectly and they stack well when used with the optional lids. Very Sturdy and help hold more when in our walk in! great way to clear off big table with a lot of dishes and glasses. Has been very durable an does what it need to do. Excellent product, we got this for both food and dish storage and it works great for either! Will be buying more soon, as we use these for about everything! We use these in our taproom for busing glassware and throughout the brewery for a variety of tasks. Sturdy, well sized, and a great price. That is a hard to beat combo. These hold up well to daily use. The smooth sides makes these extra easy to rinse and wash. Even if its a bus tub, i like it clean. This product was exactly what was pictured and is a great addition to our rental inventory. Our customers will be very happy with the quality of this product. These bus tubs do the job they are intended to be used for. These hold a lot, are easy to clean and can be banged around. These are cheap, and a low cost option, just use them for the right purpose. They do not stand up well to freezing. They crack very easily when frozen with something in them. Inconvenient.